Landing gear suspension with dampening - maybe. might also apply to landing gear. So, the idea I've borrowed is to use earplugs as suspension and I hope the attached image explains this. I've found on the net. Anyway, just a thought for now but I'm guessing the properties of foam earplugs would dampen landings somewhat. That appears to be a somewhat Rube Goldberg method of incorporating foam as shock absorption. But I love you're exploring ideas! Two small collars should do the trick - one inside the top tube and one on the outside of the bottom tube. If you can find a low friction plastic it will double as a linear bearing. Kind of like the old telescopic antennas. You'll obviously have to resize the tubes to include clearance for the collars. I'm filing this idea away for future use, thanks. Pin and slot would be simple and effective as well. 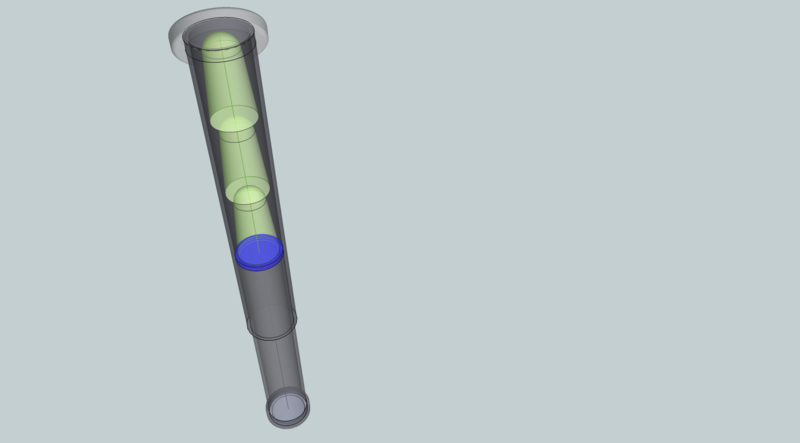 Slots in the outer tube and a pin through the slot into the inner tube out the other side. I'm thinking along the same lines but using air instead of foam or other liquid. Air won't be affected so much by temperature.